Following the decision by entrepreneur Billy Smart, grandson and heir of the late ringmaster par excellence Billy Smart, to take up permanent residence in Monaco, his Grade II-listed Georgian mansion, Nazeing Park near Waltham Abbey, Essex, has been placed on the market through Hamptons International (01483 572864) at a guide price of £10 million. As befits one of the county’s most sumptuous country piles, set in 68 acres of splendid gardens and parkland on the Essex-Hertfordshire border, ‘Nazeing Park is instantly impressive, and will be attractive to both national and international buyers, with central London a mere 24 miles away, or a 10-minute helicopter ride from Battersea heliport,’ says an upbeat John Denney, director of Hamptons’ country-house department. The Nazeing Park estate was built up between 1780 and 1820 by William Palmer, a successful London merchant and the younger son of a prominent Leicestershire family. There was already a substantial house on the land when, in 1796, Palmer had the local highway diverted so he could extend Nazeing House (later Nazeing Park) to the designs of James Lewis. Palmer’s son George, a ship-owner and MP for Essex, further enlarged the estate, which, by 1848, totalled some 600 acres. It remained in the Palmer family until 1936/37, when it was bought by Sir Walter Hargreaves. After the Second World War, the house and grounds were bought by Essex County Council and became the Nazeing Park Special School for children with learning difficulties. In 2005, the mansion became a grand family home once more when Mr Smart bought and lavishly restored the property, filling it with circus memorabilia and artwork linked to his grandfather’s glory days of the 1950s and 1960s. Previous high-profile residents of Nazeing Park have included an Archbishop of Canterbury, a Lord Chancellor, a governor of the Bank of England and a High Sheriff of Essex. Discreetly hidden behind two sets of electronic gates, the secluded, elegantly proportioned main house has some 14,500sq ft of formal and informal living space, with planning consent to extend and incorporate a leisure wing. Accommodation includes three grand reception rooms with high, ornately decorated ceilings, nine bedrooms, seven bathrooms and a three-bedroom staff flat. There is also a two-bedroom coach house and stable block with planning permission to upgrade. The extensively restored gardens and grounds boast a manège, a water tower, a walled kitchen garden and a lake with a summer house and boathouse, set against the backdrop of the estate’s well-tended woodland and rolling parkland. The restoration of historic, Grade II*-listed Glansevern Hall on the banks of the Severn at Berriew, near Welsh-pool, Powys, has been a 30-year labour of love on the part of its devoted owners, retired QC Neville Thomas and his wife, Jenny. It was built by Shrewsbury architect Joseph Bromfield between 1801 and 1807 for Sir Arthur Davies Owen, scion of one of Wales’s oldest families, who made their fortune in the early 18th century through shrewd investments in land, mining and marriage. 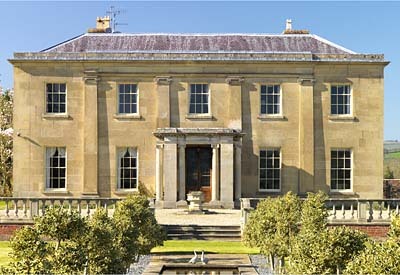 His descendants remained at Glansevern until the early 1950s, when the hall was sold with 110 acres of land to timber merchant Robert Gordon Barker. It was sold several more times in the 1960s and 1970s, before being bought in a state of disrepair by Mr and Mrs Thomas in 1982. Having painstakingly restored the main house and its once-magnificent gardens-created in 1805 but sadly neglected between 1939 and 1982-Mr and Mrs Thomas, now both in their seventies, have reluctantly decided to pass the baton to a younger team. So Glansevern Hall has been placed on the market through Balfours (01743 353511) and Knight Frank (020-7629 8171) at a guide price of £2m for the hall with 38 acres of gardens and grounds, including a four-acre lake. Less daunting than it might appear, the mansion’s 8,500sq ft of accommodation is sensibly split between the main five-bedroom house with its three charming reception rooms, a two-bedroom guest wing and an integral one-bedroom flat. There is also a two-bedroom staff cottage, with a further cottage, a range of commercial buildings, 67 acres of farmland and fishing available by separate negotiation.